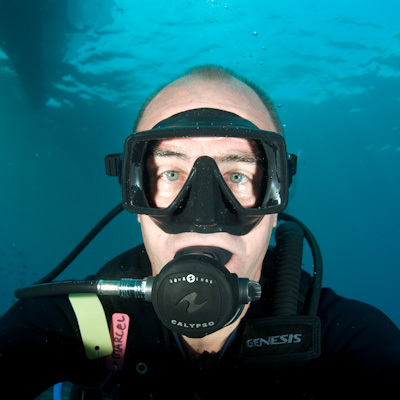 Marcel Eckhardt is a conservation and underwater photographer based in Singapore. Through his photography he shares his passion for the sea, its beauty and diversity. His work has appeared in printed and web-based publications and he has won several awards at international competitions, topped by an Honor of Distinction for his portfolio at the Celebrate the Sea underwater imaging festival in Manila, 2008. Marcel grew up near the sea in The Hague, Holland and learned to dive at 16 as part of the dive team of his local lifesaving club. Fifteen years later, urged by his girlfriend Alison, he passed his "Open Water". Shortly after, while diving in the Philippines he borrowed her Sea & Sea Motormarine underwater camera and never gave it back. Marcel has since upgraded several times and now uses Nikon DSLR cameras in Sea & Sea housings with a complete range of lenses. He still has the Motormarine and is happily married to Alison, an artist and printmaker. If they are not out exploring some remote reef, they share their time between Singapore and Bali.